Book Only One Room, or the Whole Place! There are some wonderful hotel villas in Goa, which are appealing alternatives to large hotels for anyone looking for intimate accommodations in secluded settings. Many of the villas are heritage properties that have been restored, while others are newly constructed. They are excellent options for weddings and other special celebrations, as they only have limited rooms and can be rented exclusively. Traveling with family or friends and want to stay somewhere completely private? Take a look at these 12 Exclusive Private Luxury Villas in Goa. Captivating Presa di Goa Country House is a carefully restored Portuguese homestead that's furnished in traditional Colonial style. Situated in Nagoa village, approximately 10 minutes drive from lively Calangute and Baga beaches, the hotel provides a secluded getaway in Goa. It has an inviting swimming pool surrounded in the midst of its garden. Rooms: Five exclusive suites and two rooms, all uniquely decorated and named after flowers. Rates: Expect to pay around 5,500 rupees per night, plus tax. Breakfast is included. Avanilaya is possibly Goa's best kept secret luxury villa. It's so private that from the outside, there are no signs that it exists. On the road, there's simply a nondescript gate. Apart from the fact that it's manned by a security guard, it gives nothing away, no hint of what lies beyond it. However, inside the gate is a 24 acre paradise where nature is nurtured. There are three breathtakingly beautiful villas on the property, each with their own distinct character blending chic and traditional elements. Two of them have a swimming pool. Lavish European, French, Thai and Goan meals are prepared by the in-house cooks. Aldona is situated 30 minutes inland from Panjim, in the north Goa hinterland. Rooms: 12 rooms in total. The largest villa has five bedrooms. The other two villas have four and three bedrooms each. Cost: From 11,500 rupees per room, per night. Rates for a whole villa start from 35,000 rupees per night. Turiya Boutique Villa is a pleasant change from the usual resorts and beach huts close to south Goa's prime beaches. This 100-year old villa, which has been architecturally restored and transformed by the owner, is a peaceful haven. Impeccably decorated (the owner is an interior designer), it's located in Chaudi village, five minutes from Patnem and Palolem beaches. Rooms: Seven rooms, three of which open out onto the very inviting patio. Cost: From 5,000 rupees per night, including gourmet breakfast. The entire property can be booked as well. Eclectic and graceful Vivenda Dos Palhacos consists of a 100 year old restored Portuguese mansion at the front, with an older Hindu house with thick rammed earth walls at the back. It's full of personal history, being owned by the Haywoods (of Haywoods beer fame). Features include a swimming pool nestled in the tropical garden, lively Lorry Back Bar that's partly made from the back of a truck, and social communal dinners. Also of interest is the owner's customized auto rickshaw! 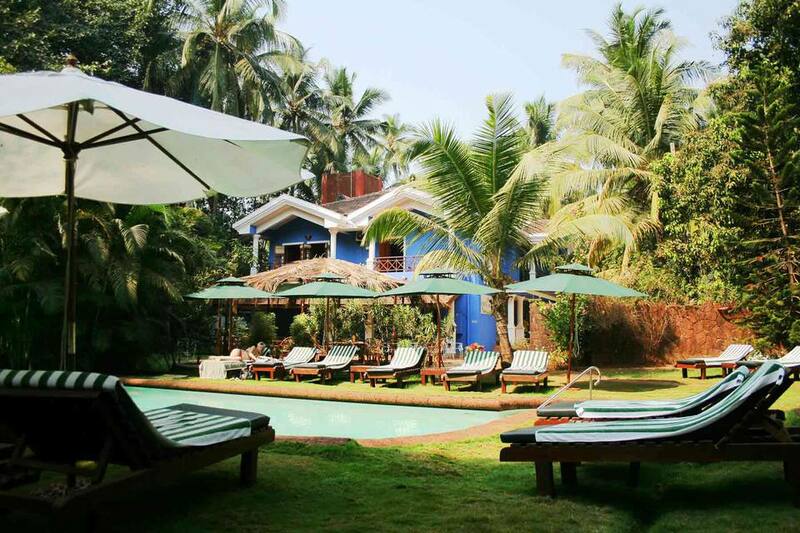 The property has a quaint village setting, about 10 minutes walk from Majorda beach in south Goa. Rooms: Seven unique rooms, all with air-conditioning, spread out over the property. Some ooze old world charm, while others are modern. Cost: From 4,400 rupees per room, per night. The whole villa can be booked from 37,000 rupees per night. Immensely popular, Beleza by the Beach is a boutique resort with 10 contemporary villas on south Goa's Colva beach. The spacious villas have two floors, with two common lounges (one on each floor), large patio overlooking the communal swimming pool, small kitchenette, and servant's quarters for guests traveling with their staff. Facilities include spa and gymnasium, conference room, in-house party planners, and private sunbathing deck. There's a weekly entertainment schedule with different activities each day. Fun for all the family! Rooms: 30 in total. Each villa has three bedrooms (one on the lower floor and two on the upper floor). Cost: From 4,000 rupees per room, per night. Rates start from 12,000 rupees per night for a whole villa. Part of the luxury boutique Casa hotel group, Casa Colvale occupies a serene and spectacular spot on the Chapora River, around 30 minutes inland from Vagator and Morjim beaches in north Goa. It's a large and modern villa that was originally designed to be a private estate. It has substantial grounds and two swimming pools. Original works of art adorn the property. Guests can take a yoga class, get a massage, or even go fishing. Rooms: 12 rooms with fusion decor and their own porches or private terraces. Cost: From 6,000 rupees per room, per night. Characterful Ishavilas gives the delightful feeling of stepping into a private home rather than a hotel. Indeed, it was newly constructed by its owners as a second home. And, it's an opulent one at that. The villa is more like a small palace, decorated with chandeliers, objets d'art, gold-braided cushions, mosaic and mirror work, and stone statues, There's also a separate cottage with private pool on the property. Facilities include library, swimming pool, wellness spa, and dining room with adjoining kitchen and in-house chef. Rooms: Three in the main villa plus one by the pool, and two in the cottage. A spiral staircase leads up to the stunning Terrace Suite, which is a highlight of the villa. Cost: From 5,500 rupees per room, per night in the villa. The two bedroom cottage rents from 13,500 rupees per night. Expect to pay about 40,000 rupees upwards for the entire property. (These rates triple during the peak season, from late December to early January, and individual rooms are not rented out during this time. In addition, the villa must be booked for a minimum 14 days). Breakfast is included. Siolim House is a masterpiece of restoration that was a finalist in the UNESCO Asia Pacific Awards for Restoration. Built in 1675, it once belonged to the aristocratic governor of Macau. It's situated about 15 minutes inland from Morjim and Vagator beaches in north Goa. For guests who are interested in Indian cuisine, Cook and Stay packages are offered throughout the year. Rooms: Seven suites, all attractively decorated with fourposter beds and antique furniture. There is also Little Siolim, a thoughtfully designed three bedroom Portuguese villa with a courtyard swimming pool. Cost: 5,500-7,000 rupees per night for a suite in Siolim House. 12,000 rupees per night upwards for the whole of Little Siolim villa. This exotic property, with direct access to a quiet stretch of Candolim beach (without any shacks) in north Goa, has seven villas and cottages to suit everyone! Its four acres are filled with coconut groves, cashew trees, and colorful bougainvillea plants. Plus, there's a spa and swimming pool for all guests to use. The owner is one of India's leading art collectors and patrons, which is reflected in the special pieces on display. Rooms: The main building is a magnificent fully-staffed five bedroom villa, and there are an additional three cottages in an enclosed area on its grounds. Each cottage has a kitchen and two bedrooms. There's another separate villa on the property with three bedrooms and its own private swimming pool, plus two separate one-bedroom cottages by the beach. Cost: From 5,000 rupees per night for a one bedroom cottage. Expect to pay about 50,000 rupees per night upwards for the five bedroom villa. Rates include airport transfers, breakfast, laundry and wireless Internet. Casa Da Praia has a convenient location in the heart of Candolim, behind the Lemon Tree Amarante Beach Resort and just a couple hundred meters from the beach. It's a beautifully renovated Portuguese house with an annex building in the same style. There are also separate studio apartments with kitchenettes. Do note that the property only accepts bookings from couples and families, not groups. A minimum seven night stay is required from October until April, and three nights the rest of the year. Rooms: Seven in total, including two in the main house. Some have interconnecting doors. Cost: From 3,300 rupees per night for an annex studio, including breakfast. This boutique resort is located on eight acres of lush hillside land in Saipem, overlooking Sinquerim River not far from Candolim beach. It has seven independent Goan-Portuguese style villas, each built like a Goan home with large porch and semi-open bathrooms. There's also a swimming pool, shared between the villas, and a herb and medicinal plant garden. Rooms: 13 rooms in total. The villas vary in size and have one, two or four bedrooms each. Price: From 6,000 rupees per night, including breakfast. A traditional Portuguese villa, Marbella Guest House offers luxury at an affordable price. It's fabulous value! The villa is located at the end of a quiet lane, just south of the Vivanta by Taj Holiday Village in north Goa. The beach is approximately 10 minutes walk away. The property has a pervasive Colonial ambiance and is perfect for couples looking for an intimate getaway. Do note that it's not suitable for children under 12 years of age, due to lack of appropriate facilities. Make sure you book well in advance if you want to stay during the tourist season (from December until April). Rooms: Three suites and three rooms, over two levels. Two of the rooms have a shared balcony. Price: From 2,000 rupees per night. Breakfast is additional. There's a restaurant on the premises. La Maison offers an atmospheric stay in a carefully restored Portuguese mansion the heart of Panjim's historic Fontainhas Latin Quarter. If you want to immerse yourself in Goa's Portuguese heritage, this evocative district is the perfect place to do so. Facilities include library, travel and tour services, and a restaurant that serves European fusion food. Rooms: Eight rooms featuring antique furniture and works of art. Cost: From 4,000 rupees per night, including breakfast and wireless Internet.